When the season changes gradually from summer to fall, hearty meals begin to make their appearance in the dinner rotation. 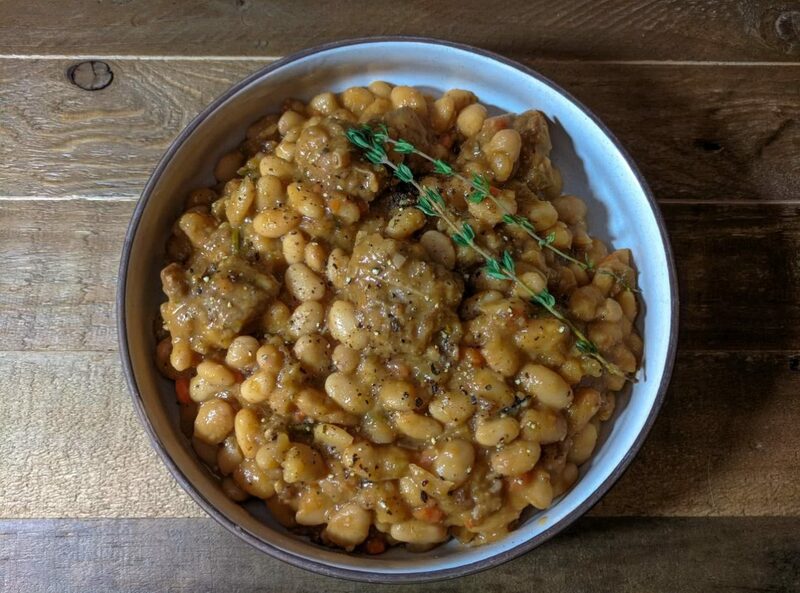 This herbed white bean and sausage stew recipe is a distant cousin to a traditional cassoulet with the abundance of white beans that absorb the delicious flavorings from the sausage and herbs, but in a fraction of the cook time. With the ease of preparation and relatively short timeframe from preparation to plating, this could easily be a regular on the weeknight dinner rotation. An added bonus is that the leftovers are even better after resting in the refrigerator! Salt 2 tsp Added 1 tsp before bringing to a simmer in stage 2 and then tasted the dish after the 2 hour simmer to see if the additional tsp was needed based on the spicing of the sausage. I ended up adding the full two teaspoons. I added a Parmesan rind to the pot before the two hour simmer. Adding diced panchetta along with the sausage in step one would be a delicious addition, keeping with the cassoulet ties. When reheating the leftovers, make sure to add more water to make the dish more liquid as the beans absorb the majority of the stew base as it rests in the refrigerator.